For Mother’s Day weekend, I was given the opportunity to take my family to the Gaylord Palms Resort for a Dreamworks Experience weekend.I’ve taken my husband and 6-year old son to ICE! in the past and it was a really nice, family friendly experience. As for the hotel, I’ve always seen it as more of a hotel for weddings or business guests. I was interested to see if the Dreamworks Experience would change the opinion I already have of the resort. A few weeks before we left, we told our son we were going on a vacation. To make sure we got an honest reaction out of him, we didn’t tell him where we were going or give him any details other than they had a pool. The day finally came and we arrived at the hotel. When we walked into our hotel room, our son’s first reaction was “Wow! This is awesome!” When I showed him our balcony, overlooking the atrium, Brandon was really excited when to see the “china fish” swimming around the castle in the atrium. We unpacked our things and set out to explore the resort. The first stop on Brandon’s list was the china fish (aka Koi). I’m pretty sure he would have gone swimming with them if we hadn’t held him back. The second stop was the pool. This is where we lost his focus. If we hadn’t had a tight grip on his hand, I’m pretty sure he would have jumped right in, fully clothed and all. We made sure to go back later that night to let him enjoy it while wearing the proper swimming attire. There were a few neat things about the children’s pool area. The first is that there’s something for every age group including baby swings and ground level entry. 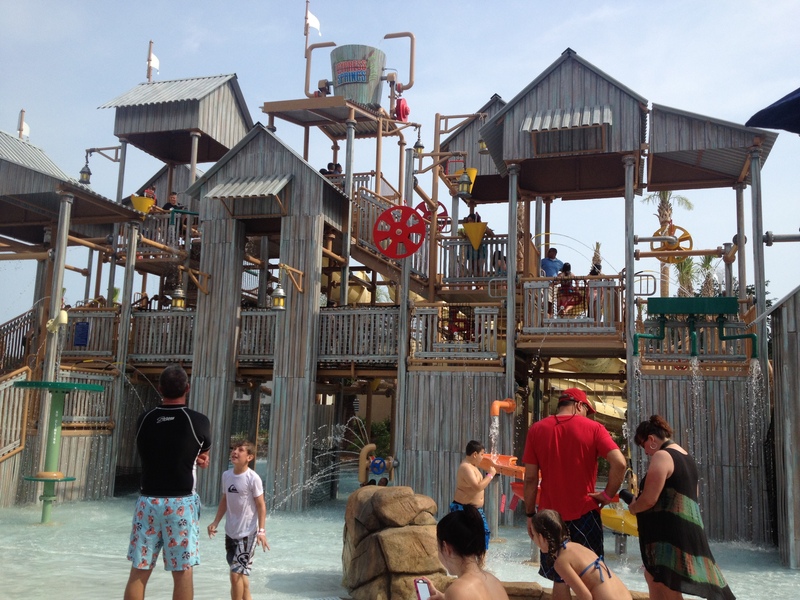 The four water slides are all at different levels so even the most terrified child has a less intimidating option to choose from. They even have four basketball hoops in the pool! The second thing is the giant screen and stage in the front of the pool.During the day, pool parties rock the area and then at night, the family can sit back and relax in the swim-in-theater. We also discovered something a little different for a hotel…a stand-alone character meet in greet. During scheduled times, any hotel guest could go and meet one of the Shrek’s friends and have their picture taken with an on hand professional photographer. The Shrek Fest character breakfast was also an interesting experience. I would never have guessed the Gaylord Palms to play host to character dining; especially a character like Shrek. The theming was everywhere from the décor to the swamp juice (which tasted better than it sounds). Brandon really enjoyed the waffles, but after hearing Donkey made them, I decided to eat the French toast instead. 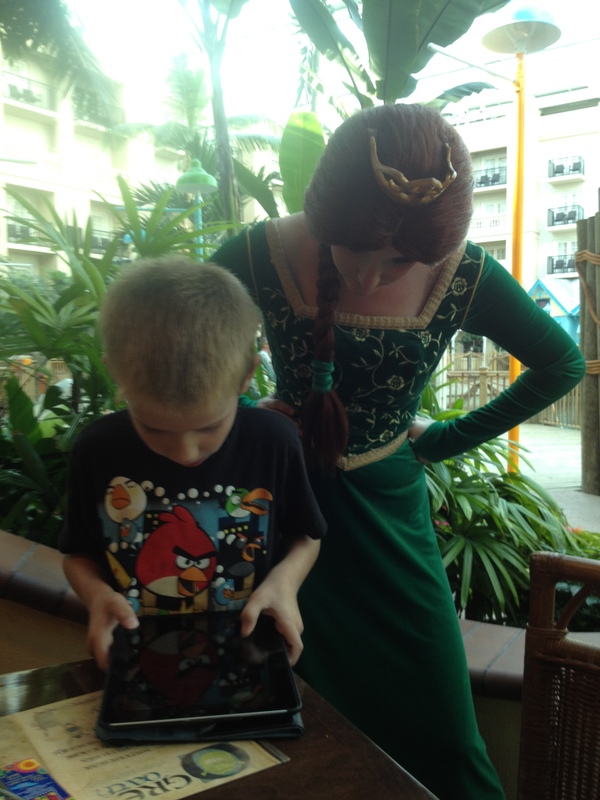 Brandon was a little skittish around Puss in Boots and Shrek, but Princess Fiona was able to win him over talking Kung-Fu and asking him to explain what Spy Mouse is to her. Saturday we spent at the theme parks and it was definitely the oddest part of our trip. The entire day Brandon was more interested on getting back to the hotel pool than riding the rides. It took us promising him some quality pool time to cheer him back. Our last day there, Brandon got his pool time. It wasn’t the warmest day, but the kids in the pool didn’t seem to mind. He happily froze while playing in the Cypress Springs Water Park area. He also discovered that the really big pool was almost four feet deep, (three feet, nine inches to be exact). This helped him swim with confidence since he could touch the bottom of the pool without going underwater. Overall, I have to say I was pleasantly surprised by the Shrek Experience. 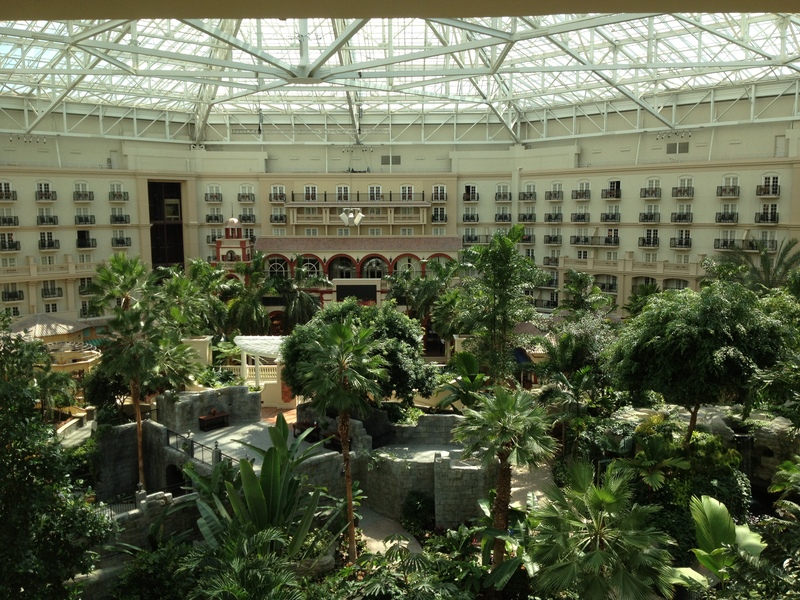 The theming was subtle and just enough to keep the atmosphere of the hotel intact. The hotel staff was as courteous as ever and always happy to help us with whatever we needed. My son was sad to leave on Sunday and declared that he wanted us to buy the hotel so he could live there. It looks to me like Gaylord Palms has their newest fan and surprisingly enough, he’s only 4 feet tall.